Here's a nice surprise: quantum physics is less complicated than we thought. An international team of researchers has proved that two peculiar features of the quantum world previously considered distinct are different manifestations of the same thing. The result is published 19 December in Nature Communications. Patrick Coles, Jedrzej Kaniewski, and Stephanie Wehner made the breakthrough while at the Centre for Quantum Technologies at the National University of Singapore. They found that 'wave-particle duality' is simply the quantum 'uncertainty principle' in disguise, reducing two mysteries to one. "The connection between uncertainty and wave-particle duality comes out very naturally when you consider them as questions about what information you can gain about a system. Our result highlights the power of thinking about physics from the perspective of information," says Wehner, who is now an Associate Professor at QuTech at the Delft University of Technology in the Netherlands. 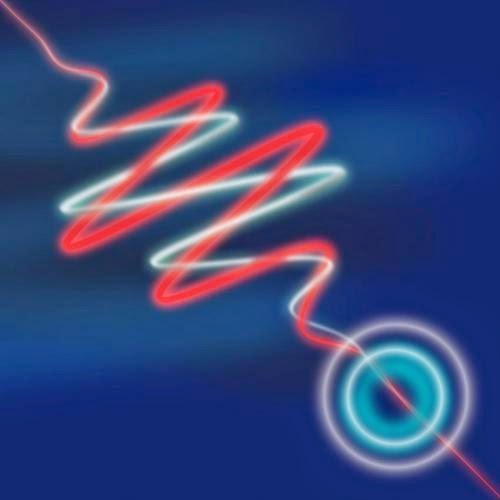 The discovery deepens our understanding of quantum physics and could prompt ideas for new applications of wave-particle duality. Wave-particle duality is the idea that a quantum object can behave like a wave, but that the wave behaviour disappears if you try to locate the object. It's most simply seen in a double slit experiment, where single particles, electrons, say, are fired one by one at a screen containing two narrow slits. The particles pile up behind the slits not in two heaps as classical objects would, but in a stripy pattern like you'd expect for waves interfering. At least this is what happens until you sneak a look at which slit a particle goes through - do that and the interference pattern vanishes.The quantum uncertainty principle is the idea that it's impossible to know certain pairs of things about a quantum particle at once. For example, the more precisely you know the position of an atom, the less precisely you can know the speed with which it's moving. It's a limit on the fundamental knowability of nature, not a statement on measurement skill. The new work shows that how much you can learn about the wave versus the particle behaviour of a system is constrained in exactly the same way. Wave-particle duality and uncertainty have been fundamental concepts in quantum physics since the early 1900s. "We were guided by a gut feeling, and only a gut feeling, that there should be a connection," says Coles, who is now a Postdoctoral Fellow at the Institute for Quantum Computing in Waterloo, Canada. It's possible to write equations that capture how much can be learned about pairs of properties that are affected by the uncertainty principle. Coles, Kaniewski and Wehner are experts in a form of such equations known as 'entropic uncertainty relations', and they discovered that all the maths previously used to describe wave-particle duality could be reformulated in terms of these relations. "It was like we had discovered the 'Rosetta Stone' that connected two different languages," says Coles. "The literature on wave-particle duality was like hieroglyphics that we could now translate into our native tongue. We had several eureka moments when we finally understood what people had done," he says. Because the entropic uncertainty relations used in their translation have also been used in proving the security of quantum cryptography - schemes for secure communication using quantum particles - the researchers suggest the work could help inspire new cryptography protocols. In earlier papers, Wehner and collaborators found connections between the uncertainty principle and other physics, namely quantum 'non-locality' and the second law of thermodynamics. The tantalising next goal for the researchers is to think about how these pieces fit together and what bigger picture that paints of how nature is constructed.